Project Pet Rescue has been created to bring awareness and support to pet rescue organizations and to encourage pet adoption, spaying and neutering, responsible pet ownership and financial support of pet rescue groups - the unsung heroes of homeless pets. The number of homeless pets in North America is staggering and only getting worse. Local pet shelters, pounds and animal controls are over populated with animals - many of whom would never have a second chance without pet rescue organizations. Pet rescues provide foster care; vet care, socialization and find forever homes for these wonderful creatures. "My journey, dedication and inspiration into the world of animal rescue and helping homeless pets came from MIKO. Miko was a rescue dog. His beloved owner died in October 2003 and he ended up at the Kingston Humane Society - poor, sweet, confused Miko - he was probably with the same owner most of his life and then all of a sudden his owner is gone and he has no home. Miko's angels were Jason Clarke, (a previous shelter employee), Bobbie Glazier of Mature Dog Adoptions, Merrie Wasson (his rescuer) and Treasure Wray who always looked out for him - all were instrumental in giving Miko his second chance. At the time he was estimated to be approximately 10 years-old, plus he was blind - not too easily adoptable in some people's eyes, but we all proved them wrong. He became the love of my life. Miko was the sweetest, easiest dog in the world and had so much life and love in him. He deserved to live happily and have a second chance. I adopted Miko once he was in rescue, but he would never have gotten that far without the dedication of a pet rescue organization. Sadly in March 2008, Miko left this world. He was a loving, sweet, gentle soul who never let his blindness get in the way. He had grace and spirit and I will never forget him. Miko changed my world - he made me want to help as many animals as possible. Project Pet Rescue was inspired by Miko and is dedicated to his memory". Miko's photo was featured in a Flare Magazine article (Nov, 2004), on Hello Doggy!. He was also photographed by renowned Toronto photographer Laurie Arsie. Miko lived with Dora, owner and president of SESLER, a leading talent agency representing Cinematographers and Production Designers in the film, television and advertising industries. SESLER is the proud sponsor of Project Pet Rescue. ADOPT AN OLDER DOG OR CAT - THEY'RE GREAT! 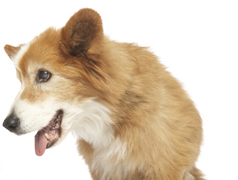 Project Pet Rescue is a huge advocate for older animals. Senior animals are special creatures with so much to give and are often over looked merely due to age. Adopt an older dog or cat and give them a chance. You won't regret it - they are low maintenance and full of gratitude and love. "A poster boy for senior dogs everywhere – Bear (Nov 1990 - June 12, 2007) graced my life on August 26, 2006 at the ripe old age of 15. Although he was just with me for ten precious months, it felt as though we were together a lifetime – this is how strong our bond was. Bear was the most special boy in the world who captured everyone's heart. In honor of my sweet Bear, Project Pet Rescue continues our mission for senior animals – Adopt one and know true love, devotion and gratitude!" For more special photos of Bear visit Bear's Webpage. "Senior dogs are already house trained, willing to please, quiet and passive - a pleasure to have around. Older dogs are the givers of so much affection, gratitude and love. There is a kind of understanding with a senior dog that comes with age, experience and wisdom. We give as much as we can to a dog who didn't have any chances left. In return, we receive a lot of love. It's a good deal." "The sad reality is that there are always going to be older dogs who, for whatever reason, need a second (and sometimes third) chance at life and love. Never let anyone tell you that older dogs cannot adjust or share that unique bond. They do. 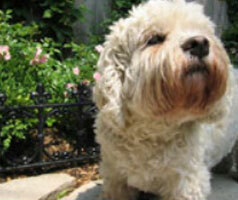 Adopters of senior dogs often say the relationship and bond they develop with their dogs is one of profound closeness. Don't deny your heart the opportunity to share the love of a senior dog for fear of losing that love. Granted, the time you spend together may not be as long as you would like, but the cherished memories you have of your beloved old friend will remain eternally in your heart." Project Pet Rescue also has a special place in our hearts for special needs animals who deserve an extra special chance. "A poster girl for special needs animals – Peggy (Sept 1994 – Nov 13, 2010) came into my life on November 17, 2007... a few months after Bear left us. She was a true gift... special, beautiful and sweet with a real zest and spirit for life. Peggy was a real trooper... she had the best attitude in life and never let her disability get in her way. She enjoyed her wagon rides, her time with the special people in her life (and she had many) and her food... she loved her food! A special gift of a Harley Davidson emblem that reads "Live to Ride...Ride to Live" was given to Peggy for her wagon and although we never had the chance to use it... I think it sums up her attitude about life. She taught me so much." In honor of Miko, Bear and Peggy, Project Pet Rescue continues our mission for senior and special needs animals – Adopt one and know true love, devotion and gratitude!